With the selection of sliding, swinging, French and bi-fold patio doors available today, you have the flexibility to create a truly custom design that complements your home’s architectural style and helps to define your outdoor living space. What type of patio door you use depends on your home’s design, your lifestyle and convenience. For example is it opening to a large outdoor living space that flows from your interior living space? Is it for a small balcony? Or is it part of a large wall of windows? Tip 1: Since swinging and French doors need room to open, consider factors such as furniture and wall placement before determining which opening method works best for the space. If space is tight, consider using a stationary panel with a single swinging door or sliding doors that fit well in any sized space. Tip 2: Choose a design that has a wide doorway to provide greater access and stronger connection to your outdoor living space. Look for folding patio door systems or integrate multiple French and swing doors into your design. Tip 3: Since glass is a major component of patio doors, you’ll want to select the right type with the most benefits and efficiency. Low-E glass helps lower energy bills all year and protects against UV fading. decorative tempered glass offers privacy and added style, while still letting in natural light. Look for options like internal blinds and grills to control the light and views. Tip 4: Choose a material that is durable and easy to maintain, especially if you plan on using your patio door as a main entrance to your home. Vinyl, fiberglass, aluminum and clad-wood patio doors weather well and never need painting. Tip 5: Just like your home’s exterior siding, the material of your patio door is equally important to your home’s overall look. Be sure the quality and style of your patio door complements your home. For example if your home is cedar, you’ll want to use a solid wood or high-end fiberglass patio door rather than a vinyl sliding door. French sliding doors offer the most design options, because you can select the door style, accessories and glass. If you want your patio door to have the same architectural style and feel of your front entry and garage doors, than you’ll want a hinged or French door, rather than a sliding patio door, which is basically all glass. Patio doors are becoming taller and wider, spanning the length and height of whole walls so your outdoor living space feels like a natural extension of your home. When it comes to patio doors, there are many new options for homeowners to choose from, like low-maintenance fiberglass that mimics the look of wood, architectural inspired-styles, decorative glass, custom colors and designs and energy efficient systems. 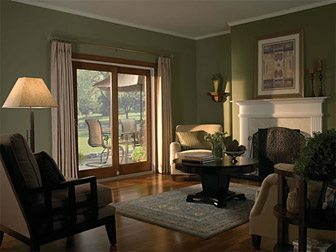 Look for ENERGY STAR® rated patio doors.